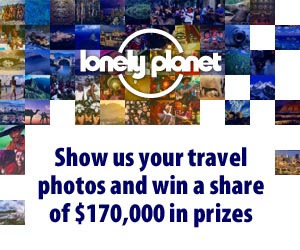 Description: Lonely Planet is looking for photos that epitomise its adventurous spirit. Originality, creativity and capturing a moment are more important than whether the photo is 'professional'. The prizes have an approximate maximum value of AU$170,000. Finalist Prizes - 200 finalists will each receive one of 200 Nokia handsets valued at up to AUD$800 each (Nokia’s N97 and N97 Mini models). Eligibility: The promotion is open to all photographers, professional or amateur. However, photographs that have won awards or competitions will not be eligible to win.